Produced by FiberHome is one of the advanced FTTx OLT equipment. It is a small capacity carrier class GPON/EPON equipment which provides maximum 8192 ONU users at the 1:64 split ratio. AN5116-06B can be configured to compatible GPON/EPONOLT platform. GPON and EPON users can be concurrently supported in the same OLT subrack by using different ONUs but of the same set of ODN facility. AN5116-06B can be also configured as10GEPON or P2P platform. 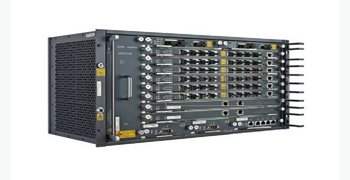 AN5x16 OLT equipment is carrier-class 10 Gigabit Platform PON central office equipment, which adopts industry-leading technology and supports full front card, front access design, as well as high-density XPON port cards. In addition, it supports GE/10GE/STM-1/E1 uplink interfaces, which can be shared on the same platform with GPON/EPON/10G PON/P2P for sustainable evolution to make the network construction more effectively. Using high performance chips makes it cost-effective, green and network reliable.